Edward Chamberlayne (1616-1703) first published his Present State of England in 1669; another two editions followed in the same year. The book is a record of every aspect of English society, and described as a ‘strong monarchist panegyric’. Over 30 editions were printed within 100 years, and each editon's frontispiece engravings represented a change, or not, of monarch. In 1684, Charles II (1630-85) was king after the Restoration in 1660. He is flanked by the two men who filled the highest-ranking offices in the Kingdom: on the left William Sancroft (1617-93), the Archbishop of Canterbury (left), and on the right, Francis North, Lord Keeper of the Great Seal, who holds the purse in which he keeps the actual Seal. 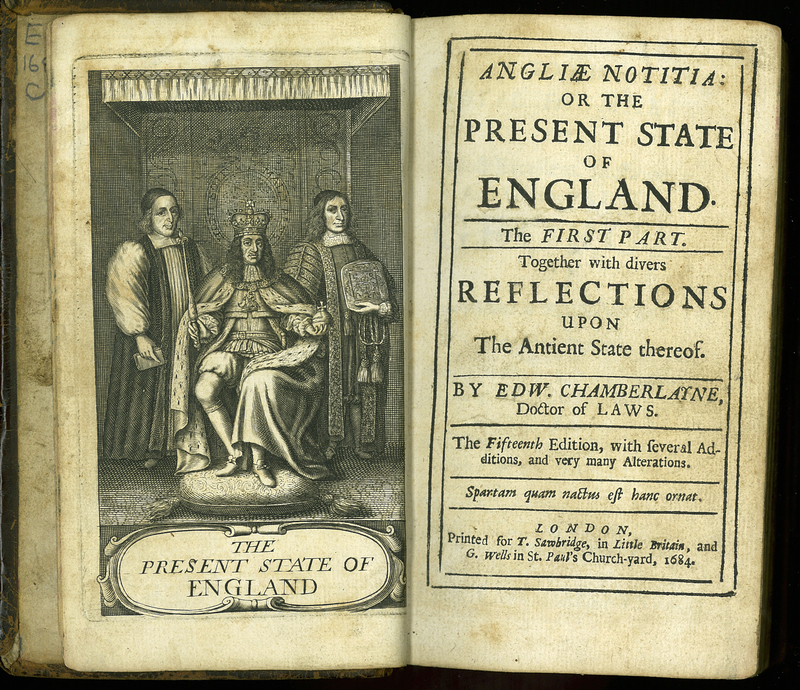 Edward Chamberlayne, “Angliae Notitia: or the Present State of England. The First Part. Fifteenth Edition,” ourheritage.ac.nz | OUR Heritage, accessed April 26, 2019, http://ourheritage.ac.nz/items/show/10681.